With The Blue Oval announcing the 2019 Ford Mustang Bullitt this week, I couldn’t help but look back at the other two Bullitt edition Mustangs: the 2001 fourth-generation model and the 2008 fifth-gen, the latter of which I think is one of the best Mustang designs of the past 40 years. When I first saw the S197-platform 2005 Ford Mustang at the Kansas City Auto Show back in 2004, I was convinced that Ford had finally gotten out of its nearly 35-year Mustang design slump. “It’s about time Ford has designed an attractive pony car,” I thought to my 13 year-old self. But it didn’t take long for the fifth-generation Mustang to grow a bit stale in my eyes, and by 2008, I once again looked at an American roadway filled with mostly meh-looking Mustangs (aside from the ’64.5 to ’70 models, of course). That changed with the Bullitt edition. It’s not about the power (315 horsepower), exhaust note, improved brakes, shorter rear differential ratio or handling modifications to the normal 300-horsepower GT on which it was based (though it’s nice to see that the Bullitt wasn’t just an aesthetics package), what made the 2008 Bullitt Mustang special to me were the aggressive, yet humble good looks. There wasn’t an ounce of chrome to be seen, the badges—including the prancing pony in the grille—were gone, the spoiler was gone, and the dark green color (which was obviously better than the optional black) just seemed to work so well with those dark gray five-spoke wheels. When I see a 2008 Ford Mustang GT in a parking lot, I don’t even notice it. When I see a 2008 Ford Mustang Bullitt, though, it stops me in my tracks. That wide, empty grille that mimics the vastness of outer space, the simple, round headlights, the beautiful gray wheels, and the hood that hangs over the grille just so. It’s a thing of beauty. My coworker Andrew, however, thinks the fourth-generation Mustang Bullitt—which came out for the 2001 model year—takes home the crown for being the most attractive Bullitt edition. He is, of course, wrong. (Not that one can be wrong on a topic like this). It doesn’t look bad, but I think the Bullitt “look”—which, of course, looks best on the original 1968 model that Steve McQueen thrashed on in the movie from which the model gets its name—really only works on retro-themed Mustangs. To pull it off, there needs to be a big, wide grille flanked by relatively small headlights, and filled with nothingness—no prancing horse, just black mesh that that looks like a window into an endless abyss. The fourth-generation Bullitt, shown above, has a tiny, narrow grille with wide headlights, and there’s a chrome horse blocking airflow. That’s blasphemy. My coworker Andrew, bless his heart, is clearly in love with the wrong Bullitt Mustang. 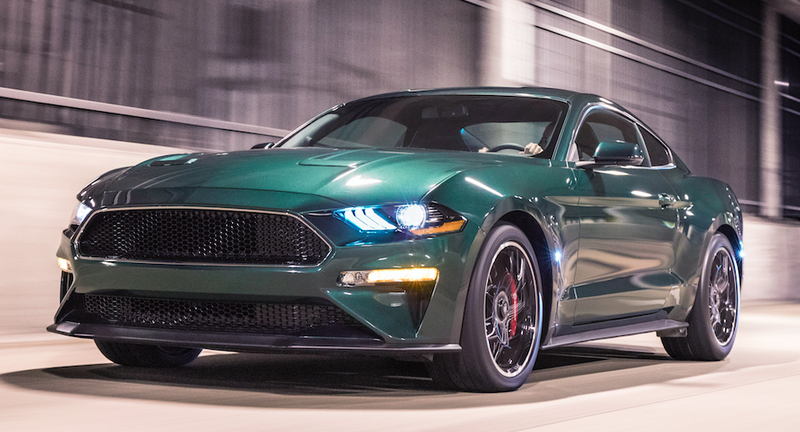 I saw the 2019 Mustang Bullitt at the Detroit auto show, and it looks damn good, in part because it’s got a big, horseless mouth up front flanked by some relatively small headlights. I think the 2008 model looks better and more authentic because of its round lights, but then again, I’ve only seen the new one for a few minutes. Perhaps it will steal my heart in the coming years. The fourth-generation Mustang, which apparently has Andrew’s heart, has no chance of stealing mine. It’s an imposter.